How Do You Start a Revolution? Opening Reception: Thursday, October 6, 2016, 6 p.m. –8 p.m.
influences, Franciscan nun Sister Karen Boccalero formed SHG, joining a wave of other Chicano printmakers in Chicago, San Francisco, and Sacramento. Sister Boccalero’s roots in activist art can be traced to her education at Immaculate Heart College in Los Angeles where she studiedunder Sister Corita Kent, influential printmaker and social justice advocate of the 1960s and 1970s. Sister Karen Boccalero, along with artists Carlos Bueno, Antonio Ibañez, FrankHernández, and others held their first exhibition in 1971. Established in Boyle Heights, SHG was enormously successful in promoting Chicano artists and outreaching to young Latino artists throughout the 1970s and 1980s, and was a means to celebrate Chicano culture, to empower a political voice, and to generate art that was rooted in Mexican tradition and that bypassed the mainstream art world. The Chicano self-empowerment movement drove the vision of SHG. Artists created art, held their own exhibitions, and sold their work on their own terms. In 1982, SHG began its seminal Experimental Screenprint Atelier, a workshop program that allowed artists to create high-quality limited edition prints using methods such as serigraphy, intaglio, and lithography. This new direction offered Chicano artists a foray into the mainstream art world and art market. During the 1990s, SHG sought a more outward-facing posture and began seeking to disseminate Chicano art to a wider audience. SHG organized the traveling exhibition, Chicano Expressions, and donated numerous artworks to archives and museums. In 1996, a year before her death, Sister Boccalero donated 42 prints to the Riverside Art Museum (RAM) to be held in our Permanent Collection. SHG continues its legacy of bringing art to the community through its programs. Día de los Muertos remains a significant cultural celebration for SHG and in Los Angeles, and the Barrio Mobile Art Studio is still active today and was recently brought to Riverside’s Eastside by RAM and the Riverside Community Health Foundation. An exhibition of prints created with Eastside residents and the Barrio Mobile Art Studio is on view in the Taylor Family Gallery. The atelier program is now the internationally acclaimed Professional Printmaking program that invites 10-20 printmakers as artists in residence each year to address a range of themes, including SHG’s traditional themes of culture, religion, politics, and Day of the Dead, as well as evolving themes of ecology, female empowerment, and gentrification. Over time, SHG has broadened its approach to art making from strictly Mexican-American heritage to the broader pan-Latin-American community, as well as to other cultures and communities that have shared aesthetic political goals. SHG, in partnership with the Museum of Latin American Art and the Richardson Center for Global Engagement, organized an international artist ambassador exchange program with the Taller Experimental de Gráfica in Cuba. Earlier this year, SHG co-produced with Social Public Art Resource Center, the Center for the Study of Political Graphics, and Art Division, a travelling exhibition called Ayotzinapa: A Roar of Silence of works by international printmakers from Mexico, Iran, Poland, Spain, Portugal, China, Greece, and other countries that call for justice for the 43 disappeared students in Guerrero, Mexico. Self Help Graphics: Aztlán, the Permanent Collection, and Beyond includes selections from RAM’s Permanent Collection by some of the iconic artists and master printmakers from SHG that were created in the 1980s and 1990s, such as Diane Gamboa, Gronk, Leo Limón, Roberto Gutiérrez, José Alpuche, Patssi Valdez, and more. On loan from SHG are works by Margaret “Quica” Alarcón, Poli Marichal, Dewey Tafoya, Miyo Stevens-Gandara, Dalila Paola Mendez, Yamylis Brito Jorge, Carlos del Toro, Dairén Fernández, Aliosky García, Octavio Irving Hernandez, Pavel Acevedo, and others. Saturday, September 10, 12 noon–3 p.m., Free with paid admission or membership. Artist Cynthia Huerta will be leading visitors in a printmaking workshop that explores pochoir, a sophisticated stenciling technique. She will also be teaching oil resist to produce prints in this workshop/taller. Thursday, September 15, 5 p.m.–7:30 p.m., Free with paid admission or membership. Artist Pavel Acevedo will lead this workshop/taller in chine-collé, a special technique in printmaking, in which the image is transferred to a surface that is bonded to a heavier support. Saturday, September 24, 12 noon –1 p.m., Free with paid admission or membership. Join the Director of Programs & Operations at Self Help Graphics & Art Joel Garcia for a talk about the history, legacy, and ongoing efforts to create Latino art in East Los Angeles and beyond, and tour our Self Help Graphics: Aztlán, the Permanent Collection, and Beyond exhibit with Joel as he discusses the artists of Self Help Graphics’ past and present. Last minute addition: Victoria Delgadillo, Artist/Curator of 2013 “Communication Threads & Entwined Recollections” Print Atelier LV will speak on the print process and vision of selected prints by Victoria Delgadillo, Patricia Valencia and Dalila Paola Mendez included in this Riverside Museum of Art exhibit. 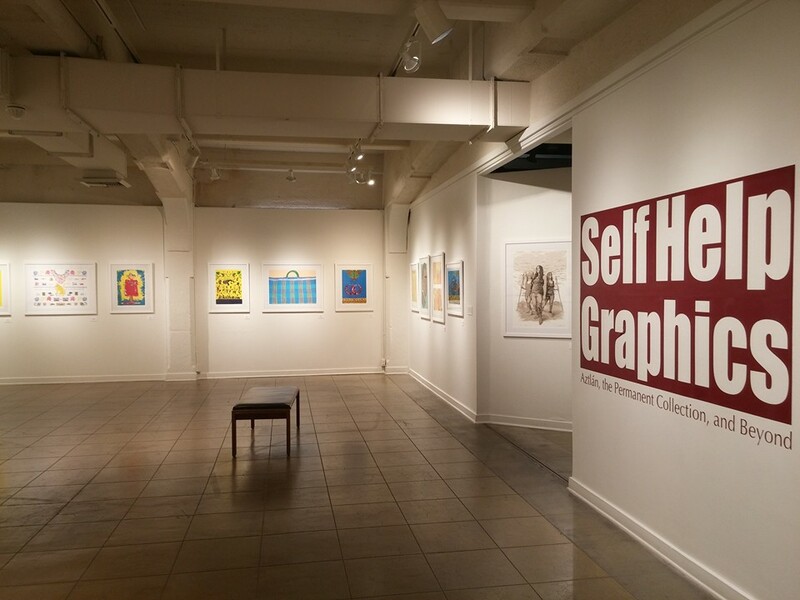 Self Help Graphics: Aztlán, the Permanent Collection, and Beyond during the October Artswalk. Come celebrate Hispanic Heritage Month with SHG and local artists, as well as with the Riverside County Mexican American Historical Society’s “Roots of Our Family” pop-up exhibition and speaker Professor Raymond Buriel at 6:30 p.m. Professor Buriel will be speaking on Mexican Culture and the Citrus Industry in Riverside. Saturday, October 15, and Sunday, October 16, 12 noon–3 p.m., Free with paid admission or membership. Join Cosme Cordova for this special two-day workshop and learn how to make alebrijes, brightly colored Oaxacan-Mexican folk art sculptures of fantastical creatures. Though these sculptures are traditionally made of wood, Cosme will be helping visitors create fun papier mâché alebrijes. All content is © 2019 by Victoria Delgadillo. All rights reserved.